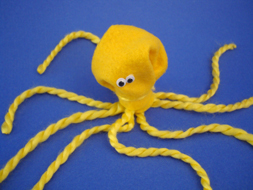 Use our printable template to make this Easy Octopus. We made the Octopus legs from yarn, but you can also use strips of felt! This is great for preschoolers on up! 1. Trace our oval template onto a piece of felt and cut it out. 2. Cut 8 equal lengths of yarn (or felt strips) and glue all around the oval. 3. Once the glue has dried stick your finger in the center of the oval and wrap the felt around your finger. Gather it at the bottom and tie a piece of yarn around the bottom to secure (if you don't have yarn just tie a piece of string or wrap around a rubber band). 4. Glue on google eyes and you're done.